The Stabile Elite Series is the highest in quality with a clean architectural shape, made from strong solid steel. The process engineering involved with manufacturing will allow years, decades, or a lifetime with a product built to withstand the test of time. Manufactured from solid steel for strength and durability with a baked durable finish in many color choices, backed by a 2-year consumer warranty. Today’s purchase of a Stabile Elite iPad Stand, will likely remain with you for your lifetime of future tablets and/or iPads generations. The Stabile Elite iPad Stands have remained the flagship front runners on the market for consistently accommodating all new iPad releases since their inception in 2010. 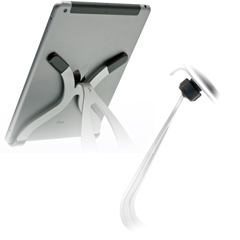 With iPad’s progressively taking the place of the traditional desktop computer, the Stabile Elite iPad Stands provide a modern segue into today’s computer station and laptop use. Couple a Stabile Elite iPad Stand with your iPad and keyboard for a modern day computer station that is stylish and ergonomically correct.